Physicists have used light and its polarization to elucidate the internal state of atoms since the 19th century. Early in the 20th century, the momentum of light was used to change the center-of-mass motion of atoms. The latter part of the 20th century brought optical pumping, coherent laser excitation, and laser cooling and trapping as tools to manipulate both the internal and external states of atoms. Atom optics techniques like diffraction of atoms from light provided the elements needed for atom-wave interferometers. Bose-Einstein condensation created atomic samples having laser-like deBroglie-wave coherence. Now, in the 21st century, the circulation of superfluid atoms in ring-shaped structures enables “atomtronic” circuitry—an atomic analog of superconduction electric circuits. We observe persistent flow of atoms in toroidal traps, and can introduce a weak-link (a kind of Josephson junction) that allows control of the quantized circulation of atoms. There is neither registration fee nor application form, and everyone is welcome to participate. 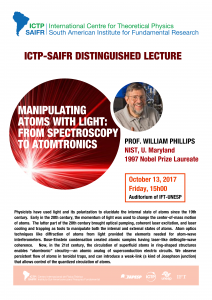 William Phillips is an american physicist working at NIST who earned the 1997 Nobel Prize together with Steven Chu and Claude Cohen-Tannoudji for his experiments using laser light to cool and trap atoms. 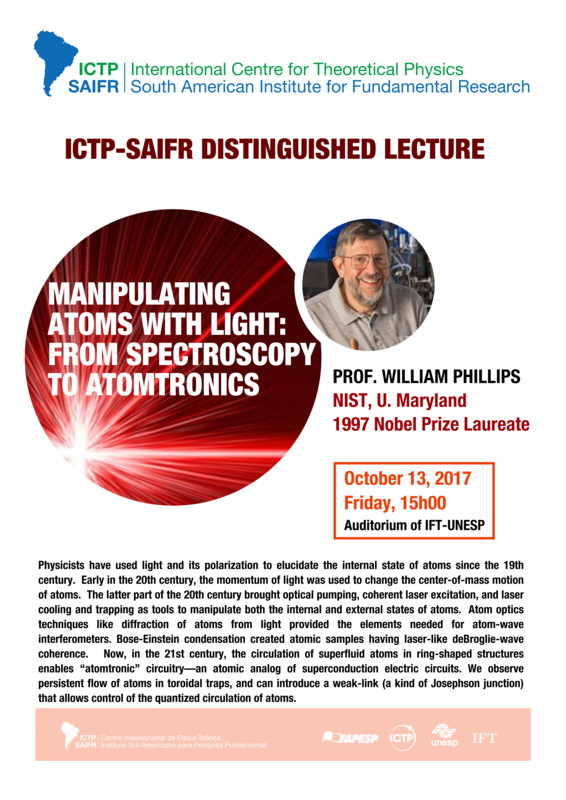 In 1976 he received his PhD degree at MIT and in since 2001 he is a distinguished Professor at the University of Maryland.